Qvortrup in the flesh Tulle: Why must it be a Loop? the Danish people's Party goes to the polls on that Lars Løkke Rasmussen to continue on as prime minister – possibly with the DF in the government. But why? 11 Şubat 2019 Pazartesi 13:02 - 2 reads. the Danish people's Party goes to the polls on that Lars Løkke Rasmussen to continue on as prime minister – possibly with the DF in the government. But why? The Danish people's Party are far more in agreement with the Social democrats than with the Left on a wide range of areas. 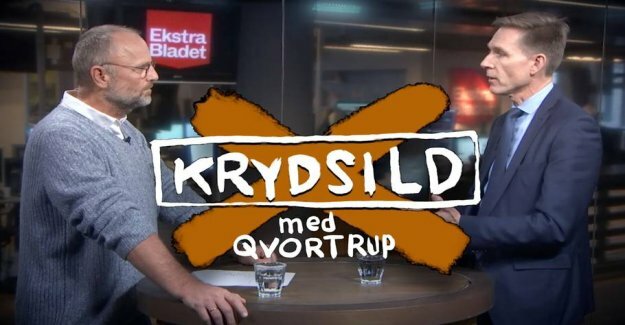 exactly what issue are trying Extra the Magazine's political commentator Henrik Qvortrup to get an answer from Kristian Thulesen Dahl in a krydsilds-interview. Thuelsen acknowledges in the interview that there IS great coincidence between the DF's and Influenced policy. And he suggests that the Danish people's Party is perhaps on its way to change from red to blue block.